A rustic rice dish from Mantova in the cucina povera tradition, riso alla pilota is named after the piloti or laborers who operating the pila, the mill where rice would be hulled and polished back in the day. (There are still some old pile you can visit today, like this one.) The Po Valley in Northern Italy has been a center of rice production since the late 15th century and, as we well know, risotto and other rice dishes are a staple of the cuisine of Piemonte, Lombardy and the Veneto. Even if it’s sometimes called risotto alla pilota, the recipe calls for a two-step method for cooking the rice quite distinct from the classic risotto method. You first parboil the rice, then take it off heat and cover it tightly, letting the rice steam. 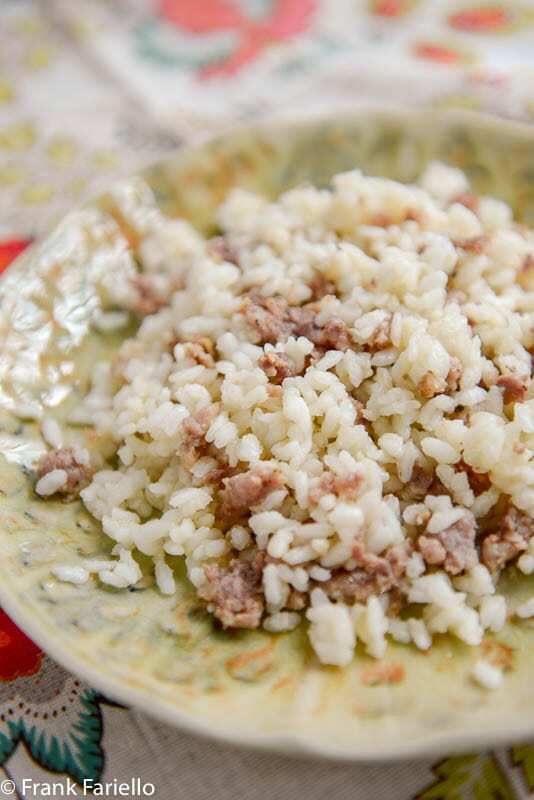 Once the rice is cooked, you fold in grated cheese and crumbled sausage meat—traditionally from Mantova’s salamella sausage—sautéed in butter. The story goes that this hands off method for cooking the rice suited the busy piloti, who couldn’t spare the time away from the pila to stand and stir the rice to make a proper risotto. A simple dish yes, and not a particularly pretty one. But when done right, a riso alla pilota is full of flavor and immensely satisfying, like so much traditional cooking in the cucina povera style. In a large, heavy saucepan or Dutch oven with a tight-fitting lid, bring a bit over 1 liter (4 cups) and a bit of salted water to a boil. Add the rice in one mound in the middle of the pot. The tip of the mound should peak just above the water. Add or ladle away water as needed. When the water comes back to the boil, shake the pan to break up the rice. Parboil the rice, uncovered, for 10-12 minutes, by which time the rice should have absorbed the water almost entirely. Turn off the heat and cover the pot with the lid, covered in a dish cloth. Let the rice steam for another 15 minutes. Meanwhile, sauté the sausage meat in the butter (and garlic clove if using) until just lightly browned. Turn off the heat (and remove the garlic if you’ve used it) and set aside until needed. When the rice is done, uncover the pot and break the rice up with a spatula or wooden spoon. Pour over the sausage and butter, together with the grated cheese. Mix well and serve immediately, with more grated cheese on the side for those who want it. Simple as it is, the recipe isn’t without its pitfalls, the trickiest part being the cooking of the rice. The rice needs to wind up fully cooked but firm to the bite, with the grains quite separate but just a bit sticky, in a kind of dry risotto. For this, you need the right amount of water and the right technique. The traditional way of judging the water is to pile all the rice in the middle of the pot of simmering water. If the tip of the rice peaks just above the water, the amount should be about right. That old time method obviously doesn’t factor in the width of your pot, so I’ve provided actual measurements in the recipe as a reliable rule of thumb. As for the technique, you’ll need to boil the rice at a pace that is neither too fast—so the water doesn’t boil off before the rice done—nor too slow, so the rice doesn’t turn out mushy or overly sticky. The water should be lively but not violent. After about 10-12 minutes almost (but not quite) all of it should have evaporated. Adjust the flame if you need to. And if you misjudge and find the rice drying out too soon, you can always “cheat” and add a few drops of water. Traditionally, riso alla pilota was prepared in a heavy copper pot. If you don’t have a copper pot, I wouldn’t worry too much. The pot should be heavy, however, so it retains its heat off flame for that second step of steaming the rice. An enameled cast iron Dutch oven, for example, would do the job. Covering the lid with a dish cloth ensures a tight seal, and the cloth absorbs any excess moisture. The sausage for making a classic riso alla pilota is Mantova’s famous salamella sausage. Salamella is made with a mix of pork belly and shoulder, seasoned with garlic, salt and pepper. As far as I can figure out, salamella not available in the US, although readers in the EU can find it online. The rest of us will have to make do with mild pork sausages, preferably one without fennel seeds. (NB: There is a spicy cured sausage from Naples by the same name, not suitable for this dish.) And if you have the time, you could also make a so-called pistume or pesto mantovano: take chopped pork, season it generously with salt, pepper and minced garlic, and let it marinate overnight. It’s the use of this mince that’s original to the recipe, replaced later by sausage for convenience, although in its native land you can buy pre-made pistume commercially. The amounts of cheese and sausage used in making riso alla pilota vary wildly from recipe to recipe, even more than the range I’ve given in the ingredients list. I suppose back in the day you used as much of these ingredients you could afford on any particular day. And I doubt anyone actually measured the butter, although it’s important to be generous with it. Otherwise, the rice will turn out insipid. The optional garlic is nice if you’re using sausage that isn’t itself seasoned with garlic like the salamella. Some recipes add a sprig of fresh rosemary to the garlic. I’ve seen some recipes that call for sautéing the sausage in a soffritto of onion. In a few recipes, you add a bit of white wine to the sausage. Some call for a pinch of ground cinnamon or nutmeg. You can make this into a piatto unico or one-dish meal called riso con puntel by serving the rice with bone-in pork chops grilled or browned in butter arranged in a kind of “crown” with the bones facing out for easy handling. In a variation on a variation, the drippings from the chops can be used to dress the rice instead of the sausage. Unlike a traditional risotto, I find that riso alla pilota reheats quite successfully. In fact, it might just taste better. Just add a few drops of water to your pot and stir from time to time over gentle heat. Meanwhile, sauté the sausage meat in the butter (and garlic clove if using) until just lightly browned. Turn off the heat (and remove the garlic if you've used it) and set aside until needed. It is delicious. At our house everyone from 7 to 47 loved it. I used chicken sausage from the Union Market meat market and it was tasty indeed. That’s fantastic, Pat. You glad you all enjoyed the dish! Frank, I was intrigued when I saw the recipe title. A few years ago our family hosted a young student from Mantova. Of course, her mother and I exchanged recipes and this was one of them. My host daughter couldn’t explain where the name originated. Now you have! Thank you! Your risotto looks delicious! Buono questo risotto Frank! Buon Anno, tantissimi auguri! While it may not be as pretty of a dish as some you have shared with us, I know that looks can be deceiving. This flavorful dish would certainly please my husband and I for an evening meal. I hope Christmas was everything you wanted it to be. I take it back, I don’t make this! I didn’t know about the two-step cooking method, but such interesting history! I’m sure I’d love this dish, how could you not? 😉 Buon Natale, Frank! Thank you for sharing all your recipes! Viva la semplicitá! Adoro questo risotto ed é cosi gustoso. Caro Frank ti auguro un felice Natale e un buon anno nuovo! Buon Natale anche a te, Alida! un piatto tradizionale che hai descritto alla perfezione ! Auguro a te e ai tuoi cari un festoso Natale, tanti auguri Frank, un abbraccio ! Tanti auguri a te, Chiara! My husband would love this , I need to make it for him. As always I learn so much by reading your posts. Thanks! And thank you for the kind words, Gerlinde! I really love all of the history and tips you offer in your posts. I always like connecting where dishes come from — makes it much more fun and interesting to cook them. This sounds lovely and as a big rice and risotto lover, I’m definitely going to seek out the the proper ingredients and try it. Thank you! Hope you like it, Valentina! Great background info, Frank, on a dish I have never cooked. But what’s not to love here, and to try? I will look for some sausage without fennel and try it. Hope you like it, Linda! Wonderful post Frank! As usual you’ve done your homework and I love the historical information about all of these wonderful dishes that you provide. When I travel I always try to eat the local specialties. I went to Mantova a couple of years ago and tried this dish out in an obligatory fashion, only to find that it was scrumptious! The dish had so little in it but the preparation was so flawless and the ingredients so good that it was shockingly satisfying. Tis’ the season for dishes like this. Great vintage one; we usually make our own sausages : now, it is just perfect cold season to make all the delicacies for that kind of dishes and some of ribs, bacon and ham to expose to smoke for a while … And, no, food doesn’t have to be attractive for us to enjoy 🙂 Thank you Frank. And thank you for stopping by! I’m impressed that you make your own sausages! I absolutely love risotto, and this sounds quite similar. I also love hearing the backstory behind recipes…it adds a whole new level of interest for me. This dish sounds simple, but extremely comforting. I bet this would be an excellent side dish for a holiday meal! I’d bet so too, David! Thanks for stopping by. As noted, how can you go wrong with crumbled sausage and copious amounts of cheese and butter? The cooking/timing does seem a wee bit trickier than risotto but this is truly pure winter-comfort. As a Minnesotan, it’s on my agenda. Actually, it’s quite simple once you get the hang of it. And as you say, hard to go wrong on the taste! Altho’ I am an avid risotto fan using the ‘old’ method of stirring the rice as welcome relaxation therapy aided by that second glass of wine which did not end up in the pot . . . . will be delighted to see whether the simplicity of the ingredients and mode can indeed lead one various ways . . .
Looks great! In South Louisiana we have something similar that is called “Oven Dressing.” Has a few more ingredients but the same idea. Love your recipes. I love the hostory of this riso, and also the method. The method is vaguely familiar – I think I have used it but without the sausage. I definitely look forward to try thing this soon. Well, it’s quite close to the old time way Asians used to make rice before the arrival of rice cookers. I think you do some Asian cooking from time to time? looks beautiful to me, thanks for sharing these old traditions Frank! And thank yo for stopping by, Letizia! Neat recipe. I haven’t had this, but need to — it sounds wonderful and full of flavor. Interesting technique in making it too — a fun recipe to prepare. Thanks! I am still surprised by Italian food: that it can be so delicious, starting often from a handful of ingredients. I have never cooked this one, only eaten out: I still remember a particular good version, where they had (untraditionally) added a brunoise of carrot-celery-carrot to the sausage … ah, and finely shredded savoy cabbage: not much of this vegetable addition but enough to make the dish more substantial and colourful… a different riso alla pilota (it was one of those new slow food osterie). on salamelle: they r really excellent. I used to have them a lot as a teenager, because a friend of my mum was from those areas and we would buy salamelle, cotechini e salame .. (I do not know if it is me, but if u have given a link for us UK readers, “here”… it seems to be inactive)…. (talking about salamelle and co: I made my first cotechino: OMGOD! still to be perfected but def a winner). A very interesting story about the Riso alla pilota and a dish I’ve not had. The method for cooking the rice is similar to the method I use for cooking sushi, except I wash my sushi rice. I assume you don’t wash your risotto rice for this dish. I never do for my risotto. A great recipe that sounds wonderful Frank. Indeed, the method is rather similar to the way Asians traditionally cooked rice, in the days before automatic rice cookers, of course. And you assume right: No washing the rice here. Thanks for stopping by, Ron! I so enjoyed reading this post Frank, as is typical of you it provides the background that brings the dish to life. The specifics regarding cooking the rice successfully are particularly helpful. A wonderful dish for the long days of winter. Thanks so much for the kind words Paula! Usually, good food is pretty food. There are some exceptions, which is problematic if you have a food blog! I can definitely see the beauty in this dish, however. Thanks, Mimi! And you’re right. Unfortunately some of the tastiest food isn’t very “bloggable”. But that doesn’t stop me from blogging about it anyway. ? Simple, yet full of flavour. A perfect meal for a busy day. The method is quite interesting, it probably came naturally to the original cooks but seems like it would take many times of practice for us to get it right. Actually not quite so tricky as that. After one or two tries an able cook will “get” it, I would think.